Posted on April 2, 2014 by Mandy	in Comic Books, FyndIt, Toys and tagged Blonde Phantom, Board Games, Captain America, Captain America Movie, Captain America Trailer, Captain America: Winter Soldier, Collecting, Collection, Collectors, Comic book, Comic Books, Comics, FyndIt, Hulk, Marvel, Marvel Comics, Spider-Man, Spider-Woman, Superhero, Superheros, Vintage Toys. Captain America: The Winter Soldier opens in theaters this week on April 4th. Marvel’s latest superhero movie teams Captain America and the Black Widow against the formidable enemy the Winter Soldier. 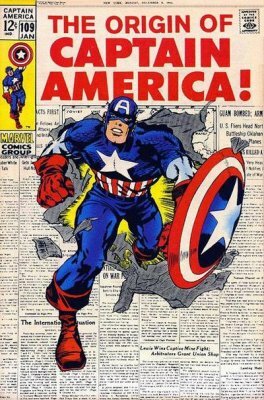 Captain America’s character first appeared back in the 1940’s. He is the alter ego of Steve Rogers, who ingested an experimental serum to enhance his physical abilities to aid in the United States efforts to win WWII. Captain America is a patriotic superhero loved by many over the decades. There are collectors on FyndIt looking for several specific Captain America comic books and memorabilia items. FyndIt is a service that brings together people who are looking for stuff with people who know where to locate hard-to-find collectors items online and in stores. If you are someone who knows where to find Captain America collectibles, check out some of the comics listed below and see if you can locate them for a bounty reward. That’s right, help others find comics and earn money! How do I make money surfing the web or window shopping for collectibles? Click on the comic covers below to check out the Captain America Wants on FyndIt. If you see something and know where to find it, add a Find with a picture and description of the item. The location of the item will be kept secret until the collector accepts your match. Once your Find is accepted, the location of the item will be revealed to the Wanter and the bounty reward will be transferred to your FyndIt account. It is super easy and secure to cash out FyndIt credit with your PayPal account. Get started finding Captain America stuff and earning money, click on the comic covers! There are other types of collectors looking for stuff on FyndIt. View more Wants on FyndIt and see if you can make a match and earn some coin. Check out the FyndIt FAQs for more information.